It's a mystery, but if Fr. George Tyrell was excommunicated in 1908 for his denial of the Virgin Birth and the Resurrection and who heavily influenced Fr. 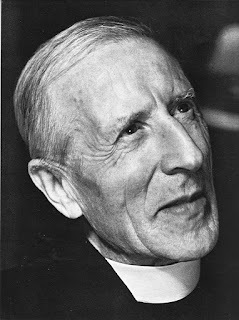 Pierre Teilhard de Chardin then why instead of just being censored and his writings banned was he also not excommunicated? I mean the denial of Hell was a good enough reason to excommunicate him, let alone his other heretical points such as the denial of needing a Redeemer and the Mass being a Sacrifice. I mean why the heck did this man become priest for? Or better yet how did he pass the seminaries believing such nonsense? Did he keep it quiet for a time or were his superiors as bad as him, at the time, for similar reason? I understand how Pope St. Pius X mauled the modernists pretty hard, but it's like they were tapeworms attaching themselves to a host and once broken up still were able to live and multiply so long as they had something to feed off of. So sad. Teilhard was charismatic and had powerful friends who protected him as much as possible in Rome. In 1947, he was forced to sign a document that stated he believed in Original Sin. Although it bothered him, he made himself seem compliant to the Church. Cardinal Ottaviani and Theologian Garrigou-Lagrange wanted him excommunicated, but with his duplicity in signing a profession of Faith, and influential friends who vouched for him, he was able to avoid formal excommunication unlike Tyrell. Very interesting. So in other words, it didn't bother him to sign something he didn't believe in. Afterwards, just keep preaching heresy and maybe nobody will notice. What a wicked man and yet the Novus ordo is considering to call him a "Doctor of the Church." The Novus Ordo just proves more and more every day how wicked it is as well. I hope Bergoglio does make him a Dr of his heretical sect. I’d love to see what the R&R and “conservative” Vatican II sect members will do to spin THAT one!! After much hand wringing and lamenting, the RR and neo-cons will eventually accept any heresy and blasphemy from their progessive wing. They will draw endless lines in the sand everytime claiming that this is the last line. Pathetic. One major problem is the average man and woman under 55 yrs old don't care about Catholicism or religion in general. I've heard a few traditional priests and one trad bishop openly declare how traditional chapels are declining in numbers or not replacing the older ones currently dying off. Careful there—I’m 54! Lol Your point is true and well taken! You are the man. What you say is so true. Everybody now is so worldly, liberal, and their priorities are so screwed up it's beyond ridiculous. The problem is that many believe like Pierre Teilhard de Chardin. As Introibo mentioned 4. "Eventually, everyone gets to enjoy happiness--there is no Hell for the wicked (Hell is considered "negative" and outdated theology). When people are told they would go to Hell if they commit a particular sin they get so offended as if they are exempt from it. We hear things like "God wouldn't send those He loves to Hell" or "How can I be happy if one on my close relatives is in Hell and I'm in heaven. It doesn't seem possible" God is all loving so how can their be a Hell etc. etc. etc. etc. etc. When there are no consequences in the mind, there is no fear. Who does this megalomaniac think he is by trying to change the Church that the Lord Jesus created? Why would anyone in their right mind try to usurp the Lord's Church? Why do people go along with it? This man was fit for nothing but to be excommunicated. For the Vatican II Sect to try to make this imp of satan a Doctor of the Church just shows how incredibly blind and deceived the Vatican II Sect is. So how many pseudo Catholic universities made this heretic mandatory reading especially in the 80’s? Marquette for sure, and I would guess Georgetown and Notre Dame as well, and this is why there are so many conciliars around the age of 55-60 who are brainwashed. I guess the question is, where isn’t he taught? You walk into any supposed Catholic bookstore and he is all over the place. Of interest: Malachi Martin (not the most reliable source to say the least), claimed in his best selling book “Hostage to the Devil,” that one of the possessed people that were given exorcism had become possessed by reading the works of Teilhard. I don’t know the veracity of the story, but do I believe his books to be THAT evil? Yes. In the beginning of the twentieth century, many Modernists had infiltrated the ranks of the Jesuits. That they would strike the Jesuits is not surprising since the Society Of Jesus was dedicated to upholding the papacy. The teachings of men such as George Tyrell had enormous influence. More and more Jesuits became infected with Modernism. Fr Pedro Arrupe became General Superior in 1965, and was a notorious Modernist. He finished off the Order by “implementing Vatican II “ and launching a full scale persecution of any non-Modernist Jesuits. The decline that began circa 1900 was in full force by the 1920s and culminated circa 1975, 11 years after the birth of the Vatican II sect. As one who attended the seminary during most of the 1970's, I can confirm that the name of Teilhard de Chardin floated around frequently and always in a manner that would make him appear as a theologian who should be considered as a positive influence associated with the "reforms" of Vatican II. I can only thank God for having protected me from continuing down that road of destruction. You were given a great grace not to have followed the Vatican II sect and their wicked "Doctor." It leads...as you rightfully state, "down that road of destruction." I attended the college level seminary in Chicago from 1969 to 1972, and lived in Chardin Hall. Enough said. Indeed it says it all. The (now closed) seminary for the Diocese of Rockville Centre (Long Island) dedicated it's library (and named it in honor of) George Tyrell, an excommunicated Modernist who died outside the Church and influenced Teilhard as I wrote in my post. This is the new religion of Vatican II, and it's destroying the world.